Geranium Rose Essential Oil, Wild Crafted, Albania This crisp and rosy essential oil stimulates the adrenal cortex and helps to balance the nervous system, while lifting depression and relieving anxiety and has a regulatory effect on the hormonal system, clearing sluggish and oily skin, while assisting with healing. Our rose geranium essential oil is extracted from the plant Pelargonium graveolens of the Geraniaceae family and has a rosier smell than that of its cousin - Pelargonium odorantissimum, which is more the commonly known geranium essential oil and has a more wild "lemon-apple" smell. If the oil is made from the leaves when they start turning yellow it has a stronger rose aroma then the younger, greener leaves. Some imitation rose geranium oil is made from the cheaper P. odorantissimum oil while distilling it over rose, to produce a mock-rose geranium oil. Our oil is however the genuine essential oil of Pelargonium graveolens. The therapeutic properties of geranium oil are antidepressant, antiseptic, astringent, cicatrisant, cytophylactic, diuretic, deodorant, haemostatic, styptic, tonic, vermifuge and vulnerary. In vapor therapy rose geranium oil can be used to help relieve stress, mild depression, PMS, anxiety and tension, menopausal problems and for general energizing. 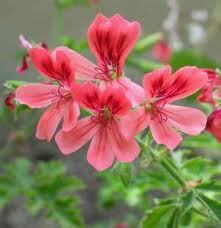 Rose geranium oil can also be diluted in shampoo to help with head lice. Although essential oils blend and mix well aroma-wise with one another, Geranium oil does go very well with other oils such as angelica, basil, bergamot, carrot seed, cedarwood, citronella, clary sage, grapefruit, jasmine, lavender, lime, neroli, orange and rosemary.